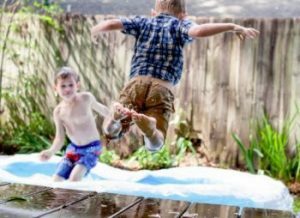 Kids love to go into the backyard to have fun. But they also have a knack for finding dangerous objects and places that could harm them. Making your backyard a safer place will prevent many outdoor injuries caused by sharp objects, broken wood, unsafe water, harmful plants and even wildlife. Here are some easy ways to ensure that kids stay safe while they play around in your backyard. Before you let the kids go into the yard, comb the ground carefully to remove rocks, sharp sticks, bottle covers and old containers. Cover all protruding wires and pipes. Fill up holes, abandoned wells, ponds and areas that can become pools or puddles after heavy rain. Remember that little kids can drown in as little as one or two feet of water. Stack up all wood products like firewood in a place that’s out of reach of kids. Children are usually tempted to climb them and they can lose their balance and fall. Some lumber can also serve as hiding places for snakes, rodents and harmful insects. Drowning in pools is a major cause of infant death before the age of four. So you need to do all you can to prevent accidents in the pool. Check for your local pool safety guidelines, and install the appropriate fencing around the pool – the barrier should at least be 1.2m high when you have a minimum of 300mm of water. Ensure that you obey all local pool safety regulations and there are no gaps greater than 10cm below the gates or panels. Lock any doors that lead to the pool area. Additionally, you can add sensors to these doors for added peace of mind. In addition to your safety precautions, provide as much personal supervision as you can. Do away with the old pipe-frame swing sets and invest in new inspiring outdoor play structures made of PVC, rope, and timber. Check the fastenings, footing, ropes and smoothness of the timber. Ensure that there are no openings that can harm a child’s head or body. While the kids are playing on slides or swings, they may take a fall. So it will be great if you can create a soft landing surface at the base of the play equipment. Avoid setting up play equipment with a concrete or asphalt base. If the equipment contains swings, let it be at least two or more meters from the nearest wall, tree or fence. Also, keep the sandbox covered so cats don’t start using it as a litter box. Take off all loose nails and splinters from the box and fill it with clean river or ocean sand. * Never push, chase or play rough while you are on swings, climbing walls or slides. * Put backpacks, bikes and other items out of the play area so you don’t fall over them. Set up a fence to ensure that your kids and pets always play within your yard. The fence should have gates that close automatically. If it’s not possible to set up a fence, create well-defined boundaries where your kids can play. If you’re particularly worried about the wellbeing of your children, you can also use a GPS tracker to keep on top of their movements. This device will keep you at peace and enable you to trace your children quickly if they stray away from your yard. Restrict play on hard surfaces to activities like bike riding. Beneath the play equipment, put a 6-inch layer of coarsely ground fir bark, wood chips or sand. Don’t use sawdust since it may contain metallic particles (nails) and could cause allergies. Mould and mildew on your patio are also possible allergens, so you should consider pressure washing once a year. Where possible grow a grass lawn. It provides a broad and soft ground for a variety of children’s games. When you purchase grass seed mixtures, avoid those with clover to prevent the influx of bees. Playing outdoors can enhance your child’s physical and social growth. If you follow these safety guidelines, you can help your kids to enjoy their play time without having any major injuries.